This drawing of a healthy tooth cut in half lengthways shows the layers of the tooth and its internal structure, as well as how the tooth relates to the gum and surrounding jaw bone. The crown is the part of the tooth that is visible above the gum (gingiva). The neck is the region of the tooth that is at the gum line, between the root and the crown. The root is the region of the tooth that is below the gum. Some teeth have only one root, for example, incisors and canine (‘eye’) teeth, whereas each molar and premolar has more roots. The crown of each tooth has a coating of enamel, which protects the underlying dentine. Enamel is the hardest substance in the human body, harder even than bone. The surface regions of the enamel are harder than the deeper layers. It gains its hardness from tightly packed rows of calcium and phosphorus crystals within a protein matrix structure. Once the enamel has been formed during tooth development, there is little turnover of its minerals during life. Mature enamel is not considered to be a ‘living’ tissue. Enamel is thickest over the incisal edges (about 2.5.mm from the amelo-dentinal junction to the surface) thinning down at the cemento – enamel junction to a knife edge. The major component of the inside of the tooth is dentine.In the crown it is covered by enamel from which it is demarcated by the amelo-dentinal junction. In the root it is covered by cementum .This substance is slightly softer than enamel, with a structure more like bone. It is elastic and compressible in contrast to the brittle nature of enamel. Dentine is sensitive. It contains tiny tubules throughout its structure that connect with the central nerve of the tooth within the pulp. Dentine is a ‘live’ tissue. Below the gum, the dentine of the root is covered with a thin layer of cementum, rather than enamel. Cementum is a hard bone-like substance onto which the periodontal membrane attaches. This membrane bonds the root of the tooth to the bone of the jaw. It contains elastic fibres to allow some movement of the tooth within its bony socket. The pulp forms the central chamber of the tooth. The pulp is made of soft tissue and contains blood vessels to supply nutrients to the tooth, and nerves to enable the tooth to sense heat and cold. It also contains small lymph vessels which carry white blood cells to the tooth to help fight bacteria. 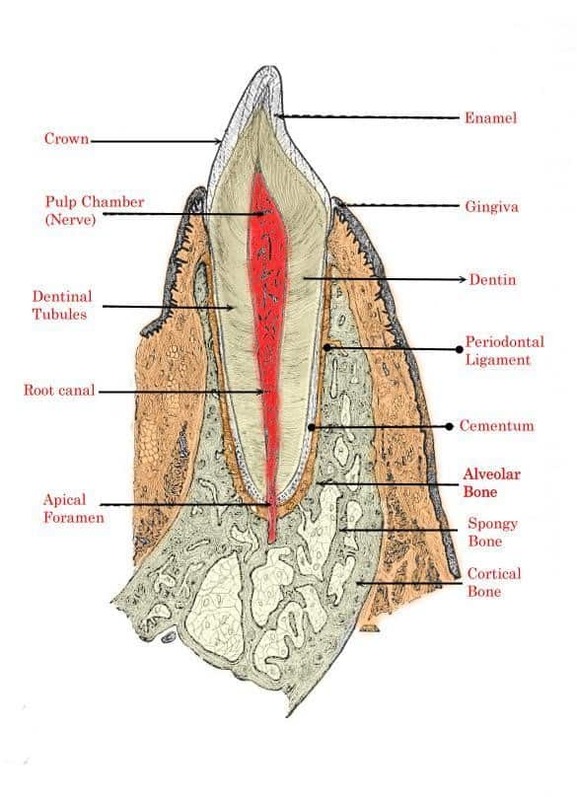 As can be seen from the above diagram a tooth is supported by the gums(gingiva) and it is anchored to the alveolar bone by very tiny fibres called periodontal ligaments. A shallow gap called a sulcus exists between the tooth and the gum and so therefore the tooth is not attached to the gum as firmly as one might think. Periodontal disease is a chronic bacterial infection that affects the sulcus. It begins when the bacteria in plaque(sticky. colourless film that forms on the teeth constantly) causes the gums to become inflamed , if they have not been removed from this area by brushing. A tooth is supported by the gums (gingiva) and it is anchored to the alveolar bone by very tiny fibres called periodontal ligaments. A shallow gap called a sulcus exists between the tooth and the gum and so therefore the tooth is not attached to the gum as firmly as one might think. Periodontal disease is a chronic bacterial infection that affects the sulcus. It begins when the bacteria in plaque (sticky. colourless film that forms on the teeth constantly) causes the gums to become inflamed, if they have not been removed from this area by brushing. This inflammation of the gums only is called Gingivitis and is the mildest form of periodontal disease. It is caused by inadequate oral hygiene which leads to the bacteria staying at the junction where the gum meets the tooth (gingival margin). Gingivitis is reversible with gum treatment and good oral hygiene. Periodontitis develops if gingivitis is left untreated. If plaque is left on the tooth for some time it spreads and develops within the sulcus. The bacteria in the plaque produce toxin which stimulate an inflammatory reaction which causes the bone supporting the roots of the teeth to be destroyed. The effects of this are that the gums separate from the teeth and the depth of the sulcus increases leading to what is termed periodontal pocketing.In healthy periodontium the pocket depth is 1-3 mm. As the periodontal disease progresses the pockets deepen and therefore the pocket depth(measured by the dentist or hygienist with a periodontal probe) increases. As the tooth looses its bone support it becomes mobile(loose) and if the tooth is too loose then it has to be removed. The assessment of the bone support is carried out by measuring the pocket depth and supplemented by radiographs. The level of the bone support can be seen on radiographs. Periodontal screening should be performed at the initial dental examination for all new patients. Patients with insignificant periodontal disease on initial examination should be screened again at regular routine dental inspections and the frequency should be every 12 months. The Basis Periodontal Examination(BPE) represents the minimum examination and data recording to constitute a screening for periodontal disease. The BPE consists of a clinical assessment of periodontal status using the Community Periodontal Index of Treatment Needs(CPITN) and appropriate radiographic examination. The CPITN was advocated as use from 1986 onwards. Localized – usually circumpubertal onset with periodontal destruction often being centred around the first permanent molars and central incisors. However atypical patterns are possible. Generalized – usually seen in patients under 30 years of age(but can be variable) with generalised interproximal attachment loss affecting at least 3 permanent teeth apart form the first permanent molars and central incisors.The attachment loss usually occurs in pronounced episodic bursts of destruction. The aims of the treatment in most cases is to halt the progression of the disease, eliminate the contributory factors and prevent recurrence if POSSIBLE. Owing to the case specific management of treatment regimes management of patient’s with aggressive periodontitis is best facilitated by a specialist periodontist, so a prompt specialist referral is often indicated. Has your dentist failed to diagnose or treat gum disease? Your dentist may be guilty of malpractice and you may be entitled to compensation. Get in touch with Dental Law Claims today to book your FREE dental claim consultation.